His start to life as coach of Borussia Dortmund has begun in spectacular style yet despite Die Schwarzgelben sitting pretty atop the domestic standings, coach Peter Bosz insists there is still room for improvement at the Bundesliga giants. The only team yet to be defeated in the German top-flight this season, BVB have been in blistering form, earning six wins in seven games while racking up 21 goals and conceding just two. Management at the five-time Bundesliga champions could not have hoped life after the departure of former coach Thomas Tuchel would begin as well as it has. And with rivals Bayern Munich floundering at the start of the 2017/18 campaign, Dortmund opening a five-point lead at the summit has fans of the Black and Yellows already dreaming of a first Bundesliga Meisterschale since 2012. “It wasn’t easy for me to gauge if [my methods] would work in the Bundesliga, because I hadn’t been here for quite a few years,” the 53-year-old tactician said in a recent, exclusive interview with publication Reviersport. “I believe Pep Guardiola had the same problem in his early days at Bayern. He had his style at Barcelona, [but he must have thought] ‘will that work here in the Bundesliga?’ You just don’t know,” the Dutchman continued. Yet it is a case of so far, so good for Bosz, who arrived at BVB following a stint with Ajax, whom he led to the 2017 UEFA Europa League final against Manchester United at the end of his sole season in Amsterdam. Watch: Dortmund's big Bosz man! Having already spoken of his admiration for Borussia Dortmund’s fans and the famous Yellow Wall, Bosz is keen to deliver a style of football that will not only bring the masses joy, but also produce winning results. A student and huge fan of his fallen compatriot Johan Cruyff, Bosz feels honoured to continue the legacy of one of the game’s all-time greats, with whom he felt privileged to spend time with. As has been witnessed in Dortmund’s eleven games across all competitions to date this season, Bosz is constantly modifying tactics and assessing his players. 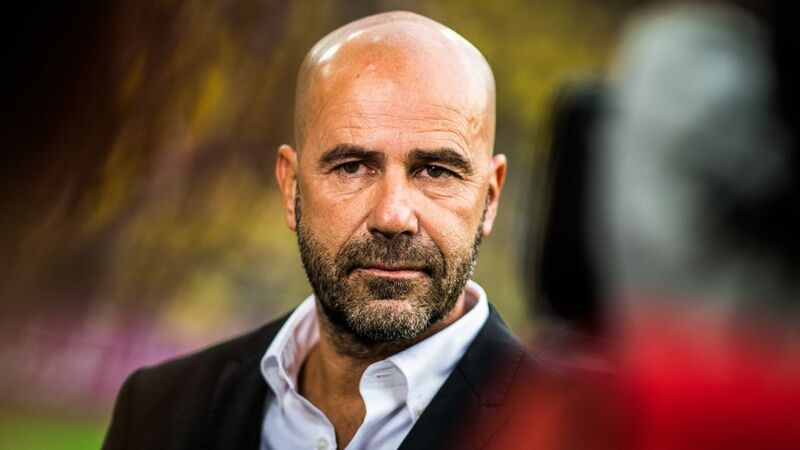 Having picked up experience in the Netherlands, France, Israel, Japan and Germany – where he played briefly for Hansa Rostock – Bosz has learned to be a keen note taker during a varied career. That search for perfection is evident in the hard work put in by Bosz’s Dortmund team, who are responding quickly to their new leader’s demands. “Each factor out on the pitch directly affects something else,” he said. “To take a fictitious example, if Pierre-Emerick Aubameyang doesn’t press hard up front, our opponents can easily begin their build-up play. "If our midfield isn’t compact, then our defenders are in trouble. Applying pressure on the opposition when they are in possession makes things tougher for them,” Bosz outlined. Until now, his methods have provided a recipe for early success, Dortmund topping the standings after each Matchday this season. With his team currently flying and Bayern faltering, is Peter Bosz on course for glory in his very first campaign at Signal Iduna Park? “Do I have any influence on what happens at Bayern? No,” he insisted. “I can only control my own team. BVB is where all of my focus is and, right now, we’re still far from where we want to be," Dortmund's new man in charge concluded.